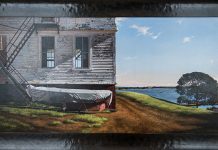 Summer Splash –– Colors & Textures brings together seven artists from a variety of different media at Louisa Gould Gallery in Vineyard Haven. The show goes up Wednesday, June 13, with a reception scheduled for Saturday, June 16, from 5 to 7 pm. Included are mixed media collages by Carol Gove, ceramics by Suzanne Hill, paintings by Ethel Grodsky, mixed media pieces by Rachel Paxton, collages by Genevieve Jacobs, and paintings by Margo Ouellette. 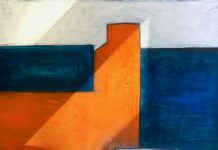 Paintings by the late Vaclav Vytlacil, the prominent abstract artist who mentored Robert Rauschenberg and Cy Twombley, among others, will also be on display. Mr. Vytlacil lived on the Vineyard and incorporated marine themes like gulls, fish and boats, into his later work. “It’s not landscapes and lighthouses,” says Ms. Gould. “It’s a really fresh, contemporary show.” What unites these disparate artists is the way they explore color, patterns, and the surface characteristics of their particular medium. Ms. Grodsky and Ms. Gove are new to the gallery. 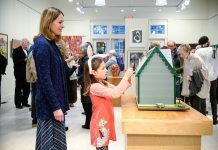 A New Hampshire resident, Ms. Gove belongs to the DeCordova Museum Corporate Art program. Her powerful abstract works on wood combine geometric blocks of color with paint drips, broad brush strokes, attached paper, and snatches of other flat substances. The combinations achieve unusual depth and complexity. Her paper collages offer a mélange of bright colors and shapes. Ms. Grodsky, a 92-year-old Floridian, paints a mix of abstract and figurative works. “Repose” combines the two, placing a figure that could be reclining or seated, depending on how the painting is hung, in an abstract background of multiple greens. The figure itself moves toward abstraction through the artist’s application of color to create shadow and dimension. “Asteroid” moves entirely into abstraction with a many-hued arrangement of muted blues, greens, and purples accented by bright yellow splashes and red-box silhouettes. The Vineyard-inspired works on paper by Mr. Vytlacil combine a playful use of color with shape-defining black lines. Some, like “Three Fish,” seem almost Cubist-influenced in composition. A series of seagull paper works practically vibrate from the artist’s forceful, masculine sketches depicting the birds’ movements and interactions. Mr. Vytlacil painted at a studio near Squibnocket Pond in Chilmark for many summers. Last winter, Ms. Gould visited the late artist’s studio with artist Melissa Breese, who had been hired to sell the work left in his house and studio. They found the Vytlacil works in the upcoming show in a folder behind a bookcase in the studio. As a ceramicist, Ms. Hill favors a simplicity of form, letting the surface effects of saggar firing come to the fore. A saggar is a ceramic container used to protect pottery in the kiln during firing. By surrounding a pot, a saggar may concentrate the effect of salts, copper wire, seaweed and other materials placed in it around the surface of the object to be fired. The results of saggar firing give Ms. Hill’s white ceramic bowls and vases a range of blue, earthy brown and deep orange patinas in unusual abstract and organic patterns created through this challenging process. Those with lids may have pieces of driftwood or stones attached as handles for opening. Of Native American extraction, Margo Ouellette paints in brilliant acrylic colors on wood and canvas. The Boston-based Island summer resident creates circular works in a palette primarily of blues and greens. Her compositions, including her spin art, have a strong design element, relying on curves, circles, grids and whorls, often with an unusual, almost architectural element in the center. Rachel Paxton joins graphic components with snatches of writing, and in the case of “Dog and Bone,” a spotted canine imagining his favorite treat. In another work, “I Love Our World,” two goldfish in a bowl exemplify the artist’s ground of red hearts and typographically whimsical use of the operative word. Other Paxton imaginings use maps, music, or historical motifs. Genevieve Jacobs collects eggs, nests, rocks, skulls and other objects for her collages. In some cases, the artist paints cigar boxes and fills them with tiny shells and other found objects. She also creates bird portraits in acrylic. Long Point 5 will perform at the opening reception. This Island quintet includes Julie Schilling on clarinet, Vineyard Haven Fire Chief John Schilling on trumpet, Morning Glory Farm’s Jim Athearn on trombone, Bud Larson on flute, and Jeri Larson on keyboard. They’ll play a variety of music, ranging from jazz to classics and pop tunes. Summer Splash –– Colors & Textures, Louisa Gould Gallery, Vineyard Haven, June 13-26. Opening reception Saturday, June 16, 5-7 pm with music by Long Point 5. 508-693-7373 or lg@louisagould.com.